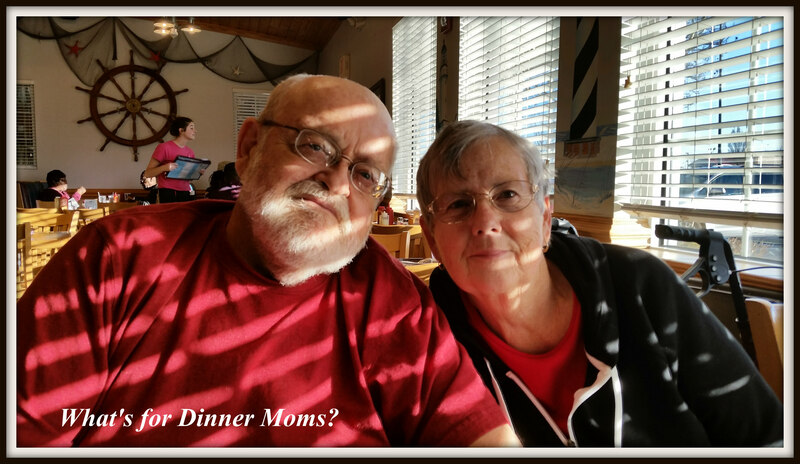 Standing on the Edge of the Sandwich Generation – What's for Dinner Moms? I don’t talk much about my family (other than my immediate family). My daughter was born when I was a bit older so I am getting to be of the age where I still have my children at home and parents who are aging and will be in need of some “assistance.” So I am standing on the edge of the sandwich generation (having children at home and parents in need of some care) whether I want to or not. There is nothing pressing at this time but I know the day is not too far away when the need will be greater for me to be able to help them. Right now my mother can care for my father, for the most part, but even that wears on her physically and emotionally. I realized at Christmas I cannot just call every few days or so and visit once a year any more. I made the commitment to try to visit at least three times this year. I brought my daughter down with me this week to visit. We are painting a wall for my mother, replacing the cushions on her porch furniture, and going with her to find a water therapy pool for my dad. These are all things my mother could do on her own but it is hard for her leave Dad for any length of time. He has fallen before and cannot get up on his own. He put his hand through a window at one point when he lost his balance. A few more inches and he may not still be here where it cut through his wrist. She is the driver now. She doesn’t like traffic, driving in bad weather, or at night so things are carefully planned to avoid those things. She just liked me driving today and to be able to run in and out of 3 or 4 stores to pick up a couple of things at each one while my daughter stayed with my father. So, I am thinking ahead. I don’t want to get caught in a situation where it is an emergency and there is no plan. I cannot believe we are in 2017 and we still do not have a system for our older population. So what do we do? We do as others before us have done and figure it out. What type of system are you referring to Marci? I am not sure I get that? I wish we had some type of system (wide spread) to help care for our aging population that didn’t cost an arm and leg or was so poorly run that you fear for their safety and health when you admit them. We need some type of gradual way (in the areas they are living) to move to non-assisted living, to assisted living to nursing home care that all people can access with dignity and assurance they will be okay. I am talking to many friends in this situation that are scrambling to find rehabilitation homes and assisted care homes that are appropriate for their loved ones. It is taking all their time and time away from their families to just find a space, which may be two or three months away or on an endless list. We can and should do better. I am in the same position as you are. My mother is turning 79 this year and she had breast cancer and chemotherapy two years ago. Her memory is not that good and she is quite fragile. My Dad is still okay but he needs a bit of relief. My parents are both now living with us in a separate garden cottage. I have found that this works much better for me than having to run up and down to their house all the time. Thanks. My parents are 750 miles away. To pull them out of the south and bring them up to the Midwest especially during the winter seems like to much to me. I would love to bring them to me. Thank you. The 12 hour drive is a bit much. I am thankful to have two brothers and a sister that live close to my parents. My mom and dad are in the same situation, my dad cannot be left alone but my mom can’t handle the constant stress. I am 1500 miles away, so driving is not an option. I am sure your parents really appreciate your visits when you can make them. Thank you. I wish I could do so much more. Totally feel your pain. That is what Mr. C goes through. His parents had him late. He’s in his early 40’s, his son is 18 and his parents are in their late 80’s. He has a lot going on. We have to create a way for people to be productive and assist the elderly while still raising their children. I guess it’s like you said and we need to remember that we are a village. I wish we could do more as a society. What about those with no children? Are they throw aways? No. So sad. Nope. We need a system that takes care of our elderly. I have no idea how to fix it? I have no kids or a spouse and I wonder about that sometimes. When I had ankle surgery and had to keep my leg elevated 23 hours a day, my mom stayed with me but she was about 82 at the time. I was going to hire in-home nursing care but she became indignant so I allowed her to help me, lol. She was invaluable for several months as were my next door neighbors. Depending on family only goes so far. Saving? Being poor or lower middle class offers little to save. Both of my parents worked very hard their whole lives but were unable to save much. Selling their house? Where they lived and the condition of the house offered them less than $60,000. That only goes so far. There have to be better answers. We need more caring folks to go into the nursing and home care professions and it needs to be more affordable. I never thought of those who have no kids to care for them when they’re older. In my family the children always too care of their parents when the time came. My sons have already assured me that Mr. C and I will be with them. I was raised with the philosophy that families should care for each other in every stage of life. It’s great you have talked about it. Having these pai full discussions with my parents this week. That’s rough. I hope things go well. I think my sons just figured they’d care for us because they saw me care for my parents. They grew up thinking that’s just what kids do. But I know it’s got to be hard for all of you. The system is called family for the lucky ones who can afford to have one caretaker staying at home. Or siblings take turns -that’s what we did with my husband’s Mom. Some of the active senior living houses and apartments are beautiful. I have a customer who moved into one in her late 50’s, she plays golf all day long. It is not the government’s job to take care of the elderly, they are part of the family. Perhaps an insurance for the time after retirement would be a solution. Sadly many have neither family nor finances to do that. I am not saying it is the governments job but we should have a system where those who are elderly can easily access care and housing that will benefit our entire society. I signed up for a life insurance that will be paid out after my 58th birthday when I knew we wouldn’t have kids. Planning for old age is part -or should be part of living a younger life to the fullest. So many of us are in this sandwich generation. Sounds like you are doing right by your folks and thinking ahead to the future. Good luck! Thank you so very much. It is a tough time for everyone as things change. Thank you. You are correct this would be an amazing opportunity for the right people that care about our elderly population. We will all be there someday, God willing, and may be in need of care too. It does help. Thank you and I wish you the best. It is not easy. Pingback: Moving Into the Sandwich Generation – What's for Dinner Moms?